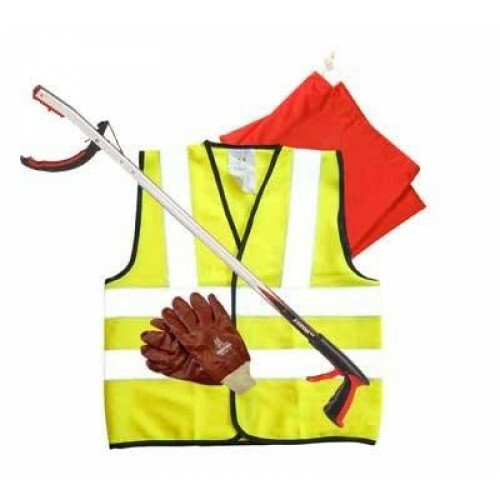 - 1 x Streetmaster pro 33"
This kit is ideal for anyone wishing to make a difference to the environment and help keep our community, waterways and beaches clean. Incorporating all the basics you need to pick up litter including the Streetmaster pro 33" featuring a double jaw which rotates 90 degrees to allow for precise litter picking in awkward areas and which grips the smallest items of litter and is the perfect shape for larger items such as bottles. Litter Picking - Tidy Beach Kit Including - 1 x Ranger Max- 1 x Large adult Hi ..
Litter Picking - Group Tidy Up Kit For Volunteers Combi Litterpicker Pro Including - ..
Litter Picking - Schools Group Exercise Kit Including - 5 x Graptor- 10 x ..
Litter Picking - Group Tidy Up Kit For Volunteers Combi Streetmaster Pro Including - ..
Litter Picking - Group Tidy Up Kit For Volunteers Adult Litterpicker Pro Including - ..
Litter Picking - Group Tidy Up Kit For Volunteers Adult Streetmaster Pro Including - ..
Litter Picking - Tidy Schools Kit with Education Folder Including - 5 x Graptor..